Hi, I’m Master G. Cabrera. 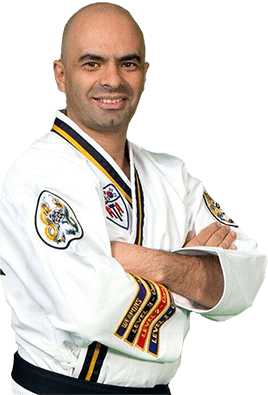 When I opened my school in 2009, I made a commitment to serving and empowering the community of Huntersville, Concord, Concord Mills, Ballantyne, Charlotte, Mooresville, Matthews, & Highland Creek by teaching children and adults the confidence, leadership and fitness skills that can only be achieved through martial arts. What Makes Winners for Life Martial Arts Different From other Karate & Taekwondo Schools? My daughter is terrified of new people! Mr G was great with her I was super surprised that by the end of class she was talking to min all on her own! Mr G is absolutely amazing with all the kids! We have been part of the ATA family for almost one year now. We started by being invited to a belt graduation by our new neighbors. We are still new to the area and only have lived here for going on 2 years. The school came highly recommended, and I can truly say that we have not been disappointed. ATA has slowly become like a family to us, even when we lost a loved one. The instructors, Mr. Revak, and Mr. English, led by Master Cabrera are Awesome! They encourage the students to be the best they can be, and they work hard to bring out the best in each one of them. They love to spend the time even after class to work on specific elements that a student may need help in. They also take great pride in working with the students to become leaders and instructors. I can personally say that my son has grown in self-confidence, respecting himself and others, communication, and continuing to be honest with himself and others among so many other things. And, they are constantly training students to become the best of themselves. The students gain confidence in the ability to work hard and achieve his or her goal whether it is to make all A’s on their report card for school, or to be the next belt or become a State, District, or World Champ - of which this school has many in each category!!! I look forward to my son becoming the next black belt. I appreciate ATA very much for welcoming us in like family. May God bless each and every single one of you. Thank you ATA Karate! Today I had my final end of the year parent teacher conference and review of our son's progress. I am excited to report that for the second straight time he has scored 100% in all subjects tested. In addition to the perfect score his teacher told me that Leo has been an amazing class leader, showing great discipline, amazing attitude, he makes good choices when no one is looking, and has been a good friend and inspiration to his classmates. Everyone I meet today had nothing but good things to say about his attitude and determination. I have to thank ATA for being a big part of his life and for helping reinforce his winners for life attitude. I can't say enough good things about what you have done for my son and our family. I am proud and honored to have you guys as part of our extended family. Thank you to the entire ATA family you all rock! I can't thank ATA Mooresville enough for all the positive changes they've made in my son and by extension my family! I have seen my son grow both physically and mentally. His teachers are so pleased with his progress and he has been able to apply his martial arts training to other sports. The positive influences from the school of Mr. Cabrera and Ms. Yeasted have proven invaluable. I will recommend them to anyone who wants to see their child improve in discipline and confidence! This school has done so much to help my son with his confidence and self esteem along with learning how to properly defend himself. He has learned so much from the staff and the life lessons they teach him. The staff are always so considerate and really kind. They go above and beyond for a extra curriculum activity. They are very welcoming and really listen to you when you have any questions or concerns. I am so glad about my son being enrolled in such a wonderful school in Mooresville.